Email exchanges are becoming increasingly unreliable due to the various servers' efforts to thwart unsolicited mail. If you would like to ensure delivery of our messages to you, we recommend you add our domain – Korean-Arts.com - to your list of acceptable correspondents (on Outlook Express: Tools > Junk Mail Filter; on Netscape Communicator: Edit > Message Filter). 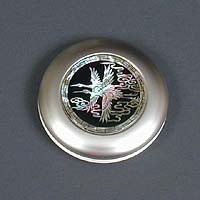 Due to numerous requests for lots of small, Korea unique items, like bookmarks, compact hand mirrors for the purse, No-ri-gae and phone fobs, we have added exactly that! Do you have a request of your own? Is there anything you would like us to carry that you don’t see on our website or, are you looking for that special piece of celadon that you haven’t been able to find anywhere? Let us know what you want and we will do our best to find it and get it up on the web for you. 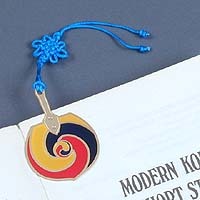 All our new bookmarks have a unique Korean flair and are made of brass to be extra durable. 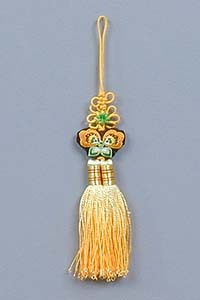 Shown is the Bu-chae bookmark which has a Sam-tae-guk symbol in the center which stands for the Asian yin and yang principle and, according to ancient Korean philosophers, is a representation of the structure of the universe. In addition to the one shown, we have eight other styles ranging from the Emilae bell-shaped bookmark, one shaped like a set of Korean han-bok clothes to one shaped like a Shilla Dynasty golden crown and lots more in between. See all our new bookmarks here or our whole selection of new stuff here. Perfect for the purse; elegant compact hand mirrors with traditional designs from Korean culture. The one shown to the right has a pair of cranes, which stands for immortality and are revered in Korean culture because they mate for life. We have four designs of the style shown at right, which is light and has a plastic case, and four designs in a slightly larger and heavier mirror made of stainless steel that might stand up to the rigors of purse life a bit better. Many of them are quite colorful with hot pinks, royal blues, and reds and have designs of roses, butterflies, and the ten longevity symbols. The inside all have double mirrors – one on each side. See the whole selection of mirrors here. No-ri-gae are a kind of pendant or trinket but really, there is no good word for them in English, so we just call them call them no-ri-gae. The word trinket or plaything is somewhat accurate in that there is also a word in Korean no-ri-gaet-gam which is a plaything or a toy. Traditionally no-ri-gae were hung on womens’ han-bok (traditional Korean clothing) at the waist to add color and class to the outfit. Nowadays they are still used in that manner when han-bok is worn, which is becoming less frequent except by older women, and they are also hung on the handles of traditional Korean furniture such as cabinets, and on doorknobs, to add a touch of color and traditional elegance. We have ten different colors and styles of the long original style and seven colors of the miniature ones like the one shown at left. The small ones are small enough they could even be used as phone fobs. See all the no-ri-gae here or all our new stuff here. As we have said before, Korea is probably the most wired country in the world and Koreans have been slaves to their cell phones (we call them handphones) for a very long time. As such, the handphone has become a fashion statement and having the right phone fob is very important. Handphones in Korea are sometimes hand-painted, covered with stickers or colorful plastic cases to get the look just right and the right phone fob is essential to the overall look. 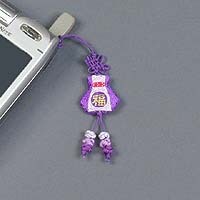 It is to this end that we have added the bok-ju-meo-ni (fortune bag) phone fobs. They come in ten colors and all have the Chinese symbol for fortune (bok) on them (Korea used the Chinese writing system until the invention of their unique alphabet by King Se-jong in the 15th Century). During the Korean Lunar New Year, which just passed on February 18, children show their filial piety by bowing to their parents and grandparents and receive money from them for fortune in the New Year. 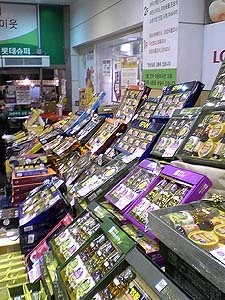 The money is kept in the bok-ju-meo-ni and represents the wish of good fortune and happiness for the New Year. See all our new phone fobs here. We love our wedding ducks and the tradition that goes with them. In ancient times, when a couple got married the father of the bride would ask a friend with the five fortunes: wealth, health, no divorces, a good wife and many sons, to carve the wedding ducks and ‘share’ some of his good fortune with the new bride. The ducks are then used during the ceremony and after the wedding, they are placed in a conspicuous place in the house and their position, set by either spouse, tells of the couple’s marital status – nose to nose means the couple is getting along well and tail to tail means things are a bit rocky. Well, we like that tradition and want everyone to share in it, so we are throwing in a pair of small wedding ducks (DS012S Miniature Colored Wedding Duck Set $5) in with every order over $50 (including shipping) through the end of March. There is no need to ask for them or click on a special button or anything so complicated. We will simply send a pair with every order that fits the bill. 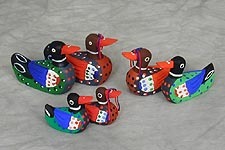 Read more about the Korean wedding duck tradition here or see our collection of wedding ducks here. Truth be told, the gifts given during the two major holidays of Seol-nal and Chuseok can be a bit strange. Many of the more expensive gifts are nice and include boxes of delicious Korean pears (Asian-pears) or boxes of marinated beef for making delicious Kal-bi (Korean sliced roasted beef). On the other hand, the lower end gifts in the $50 to $100 range include sets of relatively common items like those pictured at right, such as olive oil gift sets, Spam gift sets, and tuna gift sets or some combination of the above. The expensive gifts are usually given to close friends and family or among those seeking favor like company representatives seeking contracts and such. The lower end gifts are given to those who are not so close, or to company employees. We are not sure what one would do with a 12 pack of Spam, but who are we to judge! Korean wedding lists often include hundreds of people that the bride and groom barely know, or don’t know at all because one of the goals is to have as many people there as possible to show the import of the wedding. And this, it seems, works out quite well for the parents who must foot the bill. Wedding gifts usually include an envelope with from $30 to $100 in it from mere acquaintances and the envelopes are checked into the guest register at the front of the wedding hall and given to the parents of the couple after the wedding to help pay for the wedding (weddings in Korea are really expensive). Close friends of the bride and groom, on the other hand, want their money to go directly to the couple and not to the parents so they sometimes give the envelope to the couple surreptitiously. Very close friends may also give personal gifts like sleepwear or other clothing. At funerals, like weddings, an envelope with money is given but since they are not happy occasions mere acquaintances are not invited. Birthdays of the younger generation are mostly celebrated with friends who go out together for a night on the town and the evening almost always starts with dinner and a ‘birthday cake’. Birthday cakes are such an essential part of the scene that they can be readily purchased in every bakery, every day, anytime of the day or night. Gifts from the friends usually include personal gifts such as clothes. Business gifts are pretty much dictated by the level of the relationship. Upper level managers will sometimes give some of the more expensive gifts listed above to their superiors during the big holidays either just as gifts, or to win favor, recognition, or a promotion. The company or the boss usually gives money or the more expensive gifts to the upper level managers and the less expensive gift sets to the lower level managers. As mentioned above, the lowest level of company employees usually get the cheapest gift sets like Spam or cultural gift certificates, which are redeemable for movies, books, and other cultural events and are really quite a nice and flexible gift.